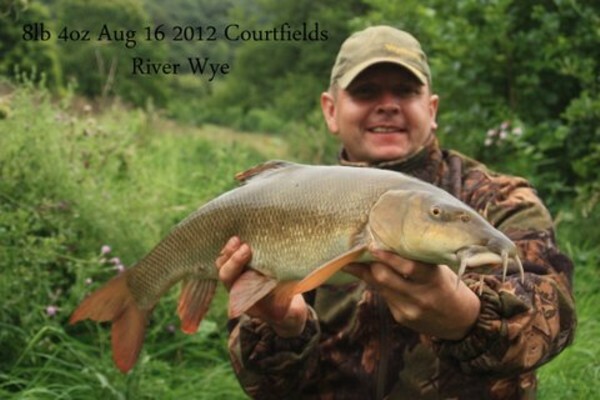 Nigel had asked if I could guide him on the Wye in catching some of the beautiful barbel that frequent the river. The weather had been very mixed in Bath and we had plenty of rain with the Bristol Avon rising over the last few days. I was wondering about the Wye, however it did rise but not by very much. Nigel is an experienced carp angler and has now seen the light and see’s the river as his next challenge. He fishes the Bristol Avon and has caught a good few barbel, but as he says “It’s been hard going”. So we met at 5.30am and travelled together the short hour journey to the fishery at Courtfields. The weather was due to be fair, but didn’t live up to it’s forecast. We arrived and setup in a good swim where a few decent barbel have been caught. On the second cast the rod whipped around and so Nigel was having his string pulled proper. 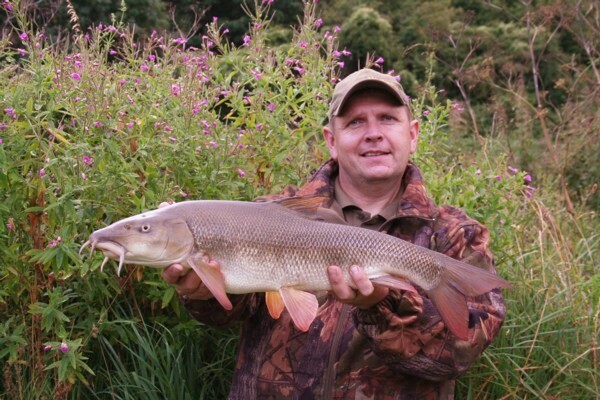 We thought it was a barbel and sure enough as it came to the net it looked about 6 to 7lbs. On the scales it went 7lbs 6oz. So what a start and there was more to come 30 minutes later when he hooked another fish that fought well but was no barbel. As it came close it tried to get into the branches trailing in the river from a downstream willow however Nigel guided it away. It looked a big chub and sure enough it was. So with a good barbel and chub from the swim we anticipated more, however nothing else showed for and hour or so other than a real downpour that soaked us both.. Thinking that the fish are not feeding here we moved to another swim where we blanked and caught nothing for 2 hours. Next move was down to the wooded area. This is the grave yard of feeders. We fished one swim and found a fairly clear area. The heavens opened while we sat under the trees. 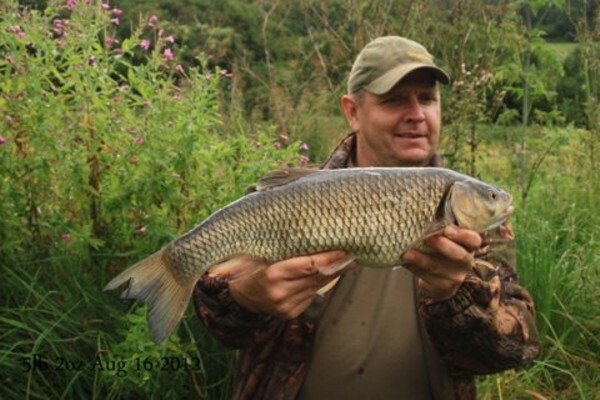 After a short while Nigel’s rod pulled around and he caught an old warrior of a chub of about 4lbs. Then we moved a bit further upstream and found another clear patch and had another chub of about 3.5lbs. So by now it was 4pm and time just passes so quickly. Venturing back upstream to fish the meadow stretch we thought that the barbel would eventually feed. We settled back into a swim we fished previously and started to fish the swim with the normal feeder approach. 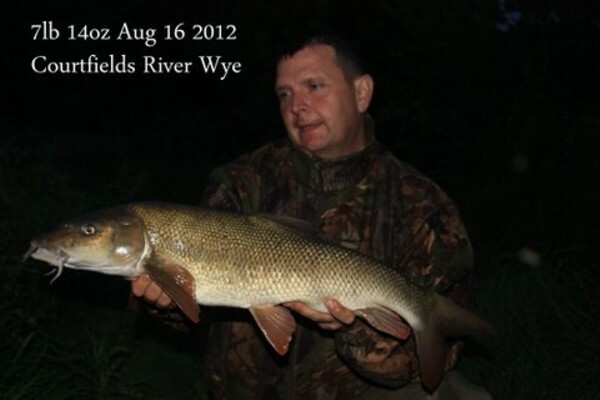 Within 30 minutes Nigel’s rod arched over and he was playing a beast of a barbel however it managed to get into a snag. Guess what another 10 minutes later the rod was away again. This time he was undone by a bolder severing the braided hooklink, and didn’t it look a real mess. 20 minutes later the rod was off again this time he did a great job and landed a nice barbel of identical weight as first one of 7lbs 6oz. So they were coming out to feed we hoped. An hour later the rod was off again this time the fish fought really well and on the scales she went 8lbs 4oz. We lost one more to a hook pull but the culprit could have been a chub. As darkness gathered and the rain still came down although a little lighter the rod belted around again and Nigel played a small barbel as we thought, but it woke up when it got close to the river bank. I thought it looked a 6lber, but subsequent weighing decide it was 7lbs 14oz. So really a difficult day lots of rock climbing, slippery muddy banks, but the sweet smell of success from the odour of the nets on the way home in the car couldn’t hid the fact that we had a good day. Thanks to Nigel for the photo’s and a very enjoyable day. This entry was posted on Friday, August 17th, 2012 at 7:54 pm	and is filed under Uncategorized. You can follow any responses to this entry through the RSS 2.0 feed. Both comments and pings are currently closed.